Our Kapaa vacation rentals provide the perfect setting for a luxurious and relaxing vacation on Kauai's "Coconut Coast." Centrally located between the south shore's Poipu Resort beaches and the north shore's Hanalei Bay, Kapaa also has its own great beaches as well as vibrant commercial district where you can dine and browse the interesting shops. On the north end of Kapaa right alongside the main road is the popular Kealia Beach frequented by surfers and bodyboarders. Families with children often enjoy the more protected area near the northern end of the beach. Kealia is a lifeguarded beach and it's best to check with the lifeguard about the day's ocean conditions to make sure you swim in a safe area. 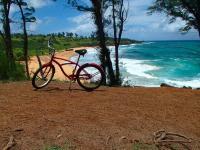 A popular activity of locals as well as visitors is riding or walking the bike path along the Kapaa shore. Follow it north toward Anahola or south toward Wailua and the family-friendly Lydgate Beach Park. Bike rentals are available from numerous Kapaa merchants right alongside the path, which is officially known as Ke Ala Hele Makalae (The Path that Goes by the Coast). Downtown Kapaa is home to two shopping centers and a wide variety of restaurants from fast food to fine dining with many of the venues offering live evening entertainment to accompany your meal. Kapaa's many preserved buildings from the plantation era now house restaurants as well as boutique shops giving the town a historic charm. For more dining and shopping options you can drive north to Kilauea town or head south to Lihue which is Kauai's main commercial center. Kapaa or Kapaa is from the local Kauai dialect that literally translates to mean solid or the closing. The coastline where the town of Kapaa was called the Kapaa Coastline based on the etymology of the towns name pertaining to the coconut laced coast. KaOhia, which means the ohia lehua trees are tabooed gave rise to the Kapaa Coastline and it depicted the cascading waters of the Pacific in the east. This once mythical land slowly evolved into a town where plantations rose up. It used to be the peaceful waters were protected by Hauwahine, the moo goddess. The misty hills north of Kapaa were also called the more pleasant Kapaa and were the sacred land of its symbolic ruler, Olopana. Today this charming community by the sea is quickly turning into a vacation destination. Its unfortunate that now there is enough traffic to have rush hour traffic jams. It is destined to be a main tourists destination before long. This destiny may not be that far away as Kapaa is now a fabulous town with quaint streets lined with fashionable boutiques and art galleries, excellent places to catch every meal with a large selection of menus from which to choose and charming cafes to catch some coffee and baked goods before hitting the beach. There is also a step back into the seventies when you enter the Coconut Marketplace. It is a bazaar with an amazing selection of merchandise from which to choose. Youll find all sorts of knick-knacks in this plantation-style shopping area. 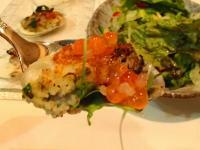 It was established in 1972 and has a popular old time Kauai style. While youre enjoying the wonderful shopping available in Kapaa, youre kids may not be having that much fun. For lighthearted little ones take them to the Kauai Childrens Discovery Museum where fun and learning mix. They will learn new things about art, science and culture all through play. Then if you want to learn something as an adult you may want to go to the Kauai Center of Hawaii Arts and Culture. There you can dig deep into the history and culture of the Hawaiian Islands and maybe even come up with a better understanding of why they call it the Aloha State. It wont take much research to find out the Kapaa has a booming agricultural industry with coconuts, tropical fruits like pineapple and other crops. You will also find that Kapaa has been through a horrific hurricane and has come back stronger to make it a place that has both a remarkable history as well as a significant future. Are you one of those who hate to pack for a vacation? Does it seem like you pack way more than you could ever possibly need short of crashing on a deserted island and having to live there for years? Do you wait until the night before to pack for a weeks vacation? Do you even have the right clothes to pack? If you are going to spend the week in Kapaa on the island of Kauai what do you need to bring? The first thing to do is decide what you will be doing while on vacation. If youre going to just hang out on the beach the entire time you wont need very much unless youre going to go out at night to different places and need to get dressed up. Its pretty laid back on Kauai so I dont think youll find too many places to wear what you would wear if you were going out in New York or Paris for instance. Once youve decided what you will occupy your time with, you then want to make a list of everything you could possibly need to take to be comfortable doing the activities you planned. That list should include everything, right down to your underwear. You need to make a list of everything you could possibly need for every activity. List it all because the next thing you need to do is start mixing and matching. What can you mix and match to do different activities with the same clothes? Start eliminating those clothes you now dont need. Isnt this cool? You start with a very long list and now its starting to get manageable and its even fun figuring out new outfits. You will find that making a list allows you to bring what you need and maybe even a little more and still not bringing all of the stuff you would bring without making a list. You might even leave a little room for those items you will be buying to bring home. Actually, when you are going through your list of what to bring you may find items that you can buy or rent while on the island and then you can eliminate it from your list. Why bring a boogie board if you only plan one day at the beach? When you get down to your final list you need to separate those must have items from those that you can live without. Things like eye glasses, extra contact lens, tooth brush, tooth paste, a change of underwear, money, credit cards, valuables and maybe a light jacket if youre traveling in the winter. Put all of these items in your carryon. That way if your luggage doesnt get there when you do, youll still be able to function. On the way home its not that important but going over it would be miserable if you didnt have your glasses when you needed them. Have a great trip and dont pack too much. Kapaa is a quaint feeling town that has a level of development that allows it to offer everything you will need yet youll feel like youre in a majestic hideaway. Youll find excitement and fun at a level that is consistent with any Hawaiian popular destination. If you havent been there you might want to get there soon as it may shortly be the next hidden destination that will of course eliminate that quaintness over time. Kapaa is located on the far east side of Kauai with neighboring cities including Lihue, Wailua, and Anahola. The 26 square kilometer city has about ten thousand residents that has a diversity equal to most Hawaiian towns made up of natives, immigrants mostly from European ancestries with some Asians that make up for a hodgepodge of ethnicities that provides an interesting mix of offerings to the visitors to the town. Youll find the climate to be very enticing with temperatures that stay around the seventies during the day and sixtys during the night. Humidity is low making this the quintessence of the tropical island paradise. Though somewhat confusing in the translation, this coastline was originally known as the Kapaa Coastline that elegantly depisted the cascading waters of the Pacific in the east. This ancient mythical land slowly evolved into a plantation town. This plantation town slowly emerged into a tourist destination and that is gradually expected to turn into one of Hawaiis main tourist destinations. Kapaa is one island town with character where the avenues and streets are abundant with chic art galleries and boutiques along with a diverse selection of restaurants and coffee shops. The town is a great place to stroll and hang out. While wandering around town on a comfortable breezy afternoon you may discover a one-of-a-kind treasure or some perfect knick-knacks to take home for your friends left behind. You may also find collectibles and paintings in some of the galleries next to the open markets teeming with trinkets that are perfect for you home. If your kid need something to keep them occupied take them to the Kauai Childrens Discovery Museum and have them learn something new in the field of art, science and culture in a fun way. If you would like to learn more about the interesting culture of the islands head to the Kauai Center of Hawaii Arts and Culture. 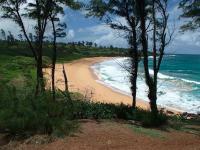 Youll find lots to do in Kapaa, look around, go see the natural sights outside the town and enjoy the beach. Aloha! Finding great food is not problem for those staying in Kapaa on the island of Kauai. There are a number of restaurants that get excellent reviews. There is one in particular that stands out from the others because it is a vegan restaurant and offers so much more. You will find excellent food, excellent service and wonderful entertainment at The Blossoming Lotus Restaurant, home of Vegan World Fusion Cuisine. Now you may think all vegetarian food is weird and not for you but you really should try some of the menu items before you leave Kauai. It is certainly different but you may be pleasantly surprised how tasty it can be. It is located in the heart of the quaint little Kapaa Town. There you will find a celebration of international food, music, art and the wonder of nature. For many it has been the best they have ever experienced. The philosophy that radiates throughout the entire place; the chefs, the food, the servers and the building is one that follows the principle of nonviolence and guides all in the use of the abundance of the plant kingdom for their recipes. The belief is that a gourmet meal fro m the plant kingdom can be enjoyable, healing and transformational. If you are like many world travelers, you may be more open to trying something new and a little different during your travels. If so, this should be on your list of places to try. You will have a choice of gourmet vegan and live food from which to choose which you will enjoy in a healing and inspirational setting of art and music that is from all over the world. You can even take pleasure in their outdoor tropical courtyard. You may just want to come in for a cup of tea and delicious dessert or a scrumptious glass of juice and a baked goodie that are beyond description. If you are with a group of people who may or may not have tried a vegan meal before, you are welcome to reserve the VIP room and enjoy not only the cuisine but the opportunity spend quality time with your friends and family in a quiet and respectful hideaway. Maybe you are having a party, a wedding, an anniversary, or just a gathering of friends or associates and you would like a healthy delightful meal. The Blossoming Lotus Restaurant offers catering so contact them to see what is available for your gathering.